Both fruits and vegetables are critical for a healthy life. But sometimes I think we over-emphasize vegetables at the expense of fruits. Perhaps it is because of the fructose (sugar) in fruits? And yes, there are some discussions that suggest the sugar in fruits could affect blood sugar and weight. However, it is important to note the sugar found in fruits must be distinguished from the fructose that is found in some sugary drinks and sodas. The sugars in fruits are present with whole hosts of other nutrients including fiber, which tends to slow down the absorption of fructose. And there are studies showing that eating fresh fruits may not increase the risk of diabetes. My takeaway from all the studies is that we need to exercise moderation with whatever we eat. Too much of anything good, even water, can create health issues. So lately, I’ve really been craving peaches, which are now in season in California until early September. The peach is native to China and is considered a stone fruit, meaning it has a flesh and pulp covering a stone (the pit). You probably know how sweet, delicious and juicy the flesh of a peach is, but what you may not know is that you can use the pit. The pit of the peach has a taste similar to almonds. You can grind the pit and add to preserves, syrups, liquors and baked goods to add even more flavor. There are hundreds of varieties of peaches grown in the U.S. and thousands of varieties grown globally. Most peaches in the U.S. have a yellow flesh and have more of a tang than white peaches, which are very sweet and popular in Asia. Some peaches are called freestone peaches, meaning the flesh of the peach does not stick to the pit. Clingstone peaches are exactly what they sound like they are, peaches that cling to their pits. In addition to the variety and delicious taste, peaches may help fight some of the most threatening diseases, like cancer. In 2010, researchers at Texas A&M University conducted a study that disclosed peach (and plum) extract killed aggressive breast cancer cells without killing healthy cells. Cancer treatment, like chemotherapy, may kill both healthy and cancerous cells. This is why chemotherapy is often very tough on the body. In the study, the peach extract came from the “Rich Lady” peach, a yellow-fleshed semi-freestone peach. Additionally, in 2014 the same university conducted another study with peach extract, and they reported it may inhibit breast cancer metastasis in mice. Two types of phenolic compounds are believed to be the cancer killers in these studies. Phenolic compounds are organic compounds that occur in fruits. The compounds in the peach extract, which researchers found particularly high levels of, are called chlorogenic and neochlorogenic compounds. Peaches are also packed with essential vitamins and minerals. Fiber, 2.3 g. Fiber may help relieve constipation, soothe irritable bowel syndrome (IBS) and may even help prevent colon cancer. Potassium, 293 mg. This is a must-have mineral. Potassium works with sodium to balance the fluids and electrolytes in your body. It helps keep blood pressure under control and may help reduce kidney stones and bone loss as you age. It may also help decrease your risk for stroke. Phosphorus, 31 mg. This mineral works with calcium to help build strong bones and teeth. It is also needed to help balance and use other vitamins and minerals including vitamin D, iodine, magnesium and zinc. Vitamin C, 10.2 mg. Vitamin C has numerous benefits. It helps boost the immune system, prevent scurvy, promote healthy hair and collagen growth (which keeps your skin youthful and beautiful) and may help you recover faster from wounds, even wounds after surgery. Folate, 6 µg. Folate (also called vitamin B9) is a very important nutrient, especially for pregnant women. Folate may help prevent cancer and heart disease and improve mental health. Choline, 9.4 mg. Choline is a nutrient that was recognized as an essential nutrient by the Institute of Medicine (IOM) in 1998. “The importance of choline in the diet extends into adulthood and old age. In a study of healthy adult subjects deprived of dietary choline, 77% of the men and 80% of the postmenopausal women developed signs of subclinical organ dysfunction (fatty liver or muscle damage)," reports the National Institutes of Health (NIH). Vitamin A, 502 IU. This vitamin is an antioxidant that supports the immune system and is good for skin and eye health. Vitamin A also promotes cell growth. 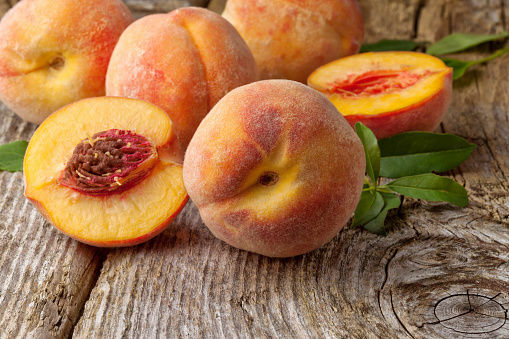 Peaches are great in a smoothie or sliced over oatmeal. During the summer months, I like to grill them and throw over a salad with dandelion greens. The combination of the sweet peach and earthy taste of the greens makes a perfectly balanced and delicious salad. For more recipes with peaches, click here. Healthy food is medicine, and fruits contain many important nutrients. It is important that we learn as much as we can about different fruits to have variety in our diets.